Imagine a weekend trip fully planned. Plane tickets, booked. Hotel, booked. Itinerary planned. Pack Up + Go is a surprise travel agency that can plan your next weekend getaway in the United States, from start to finish. I discovered Pack Up + Go, a year ago on social media and knew instantly I wanted to book a trip with them. A weekend trip somewhere in the United States that I don't have to plan? Yes, please. Don't get me wrong, I love research and planning trips, but it can be incredibly time-consuming. I also wanted to test myself a little bit to see if I could relax and surrender to the experience. The real decision was who to take with me. Not everyone would be ok with paying that kind of money up front to total strangers and show up to the airport without knowing where you are going. I mean it sounds kind of crazy right? My mom’s birthday is in January and I thought this would be the perfect present. She happily agreed to be part of the experiment. From the budget to the itinerary, I'm breaking down all the details on the Pack Up + Go process and reader questions below. The first thing to do is decide on your budget and dates. Pack Up + Go needs 4 weeks to plan the trip so think ahead. In terms of the budget, you can road trip to a destination 3-4 hours away (packages start at $400) or spend a little more for an adventure by air (starting at $650). Next comes the survey. It is comprised of travel style questions, activities, and very importantly it gives you the opportunity to let the planners know where you have already been in the last year and if you have any other trips planned for the year. It would be helpful for your travel partner or group have similar interests or at least be open to similar experiences (i.e. go to a spa vs hiking). A weekend isn’t a long time so being able to decide on the day's activities once you land is crucial. Reader question: What restrictions did you give them? I made sure to tell them all of my personal trips from 2017 and any upcoming trips for 2018. My mom's only request was to go somewhere warm. There are some sections of the survey to provide more details like accommodation preferences, dietary restrictions, traveling with kids, physical limitations, etc. You can also email them with additional questions before you sign up. This was the hardest but most exciting part. My mom and I talked weekly about the trip, speculating and dreaming about where they would send us. About 1 week before the trip we got some helpful clues! A weather forecast and packing information. I should note if you are traveling in the winter time there is a question about wanting to embrace the cold or go somewhere warm(er) on your trip. My mom is a beach girl so we opted for warmth. I shared this info my Instagram stories and y’all went wild! It was so much fun chatting with everyone about their ideas. If you want to follow along with me on my trips, check me out on Instagram. So we didn't really follow the rule on this one… The Pack Up + Go team gives you all the details about when to arrive at the airport so most people wait to open the envelope until they arrive at the airport. Our flight was so early in the morning that we opted to open our info the night before. We popped some champagne and I let my mom do the honors. I love SF so I was stoked and my mom had never been there so she was beyond excited. We looked through our cleverly presented packet of information to see some of their plans for us and I was thrilled to see a restaurant reservation with a gift card, tickets to the SFMoma, and an Uber gift certificate. With a few plans already made, I rested easy. The following morning we made our way to the Indianapolis Airport to start our adventure. The check-in process was a breeze; we’d planned ahead and packed carry on bags (I’m a terrible packer but their tips helped me so much) and our boarding passes were emailed to us in the early morning. Also in email and packet was our hotel information including our confirmation number making that check-in process easy as well. Absolutely. We're already plotting a trip for my younger sister's 30th bday! The trip was a total whirlwind (more on what we did in SF later) but I am so glad we did this. It was a really fun way to surprise my mom and celebrate her birthday. I loved it because the suspense was so exciting and then realizing on the plane I didn't have to do anything (except enjoy) was so liberating. Logistically our trip was a little different because my mom and I are based in two different cities so I let them know we could fly out of the same airport if that made the trip easier/more cost effective and they planned accordingly. My mom came to Indiana a few days before our trip so we could fly out of Indy on the same flight. The team was incredibly responsive and helpful with all of my questions that I knew we were in good hands. If your group is a little different just communicate with them and they'll help you as much as possible. The provided a great list of suggestions for our time in San Francisco. The restaurant recommendations stood out to me because none of them were cheesy tourist traps, which I really appreciated. I love food and really like to experience local spots and they did a great job finding memorable places. Reader question: Was there anything on your itinerary that didn't fit your interests? Not really. There were some typical sites on one of the itineraries like Alcatraz, The Golden Gate Bridge, Fisherman's Wharf, etc. But they sprinkled in little tidbits like a great local coffee shop, boutique or a self-guided biking tour that I probably wouldn't have found otherwise. I will say that they give you WAY more than you could ever do in one weekend. My plan is to save all of their itineraries to guide me on another trip to San Francisco. They are also working on an app which will have digital versions of their itineraries which I think will be a game changer. They do provide links to a mobile site with your itineraries and maps if you don't want to lug around the itinerary packet. On our trip, we did do some of their suggested activities and then we deviated a little bit too so it was a mix of planned activities and spontaneity. 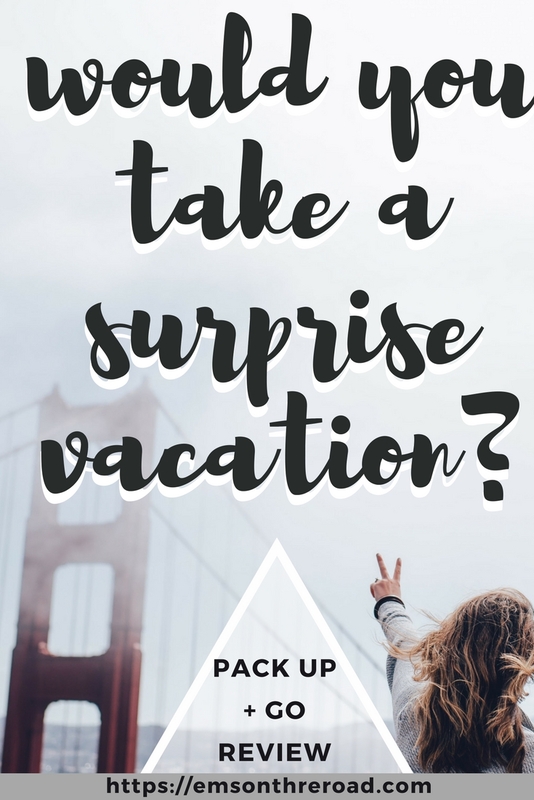 If you like surprises, then taking a trip with Pack Up + Go is for you. If you want to travel but don’t feel like you have time to plan a vacation then their trips were made for you. They literally do all the work for you, you just go and enjoy! When asked how you heard about Pack Up + Go, please mention Em's on the Road!